28 years old Brenton Lawrence is a professional rugby player who plays for the Manly-Warringah Sea Eagles team in the National Rugby League competition played in Australia. Before joining the Manly-Warringah Sea Eagles team in the year 2013, he played for the Gold Coast Titans team since making his first grade debut in the Australian National Rugby League in the year 2011. Born on 29th December 1984 in Queensland, he plays at the prop for his team. He has so far played 18 games in the National Rugby League scoring 2 tries in them. 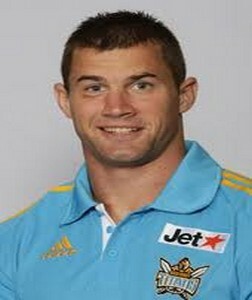 He was never a regular in the Gold Coast Titans team during his tenure with them. He will be looking to play more consistently now with the Manly-Warringah Sea Eagles team in the 2013 season. This entry was posted in NRL and tagged Brenton Lawrence, Manly-Warringah Sea Eagles, Titans. Bookmark the permalink.